In the midst of all the excitement of procuring a few coveted pieces of Lanvin pour H&M, I completely forgot to post the Part Deux of my glutton-fest in London. K is my best friend's little girl's godmother and has only recently returned to her country of origin after spending many years in Australia. She's mad for Chinese food and was dying to drag me along to her favorite yum cha restaurant in town. I'm useless at ordering dimsum dishes so was persuaded by K to call around my other girlfriends to join us. Em, my other yum cha-mad friend and J who eats more than any man or woman I know jumped at the opportunity. So, what does a Hong Kong born (Em) and bred girl and a British/Russian/Polish/Aussie girl (K) have in common? 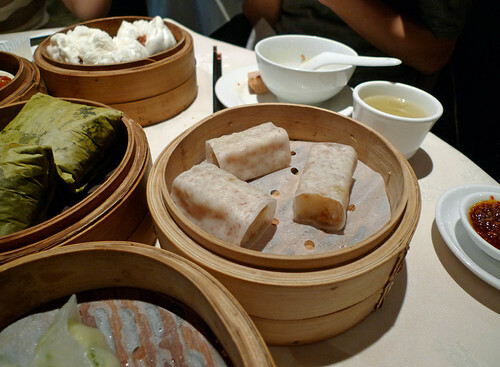 Yum Cha. I've never seen two people who got so excited and practically orgasmic over yum cha. 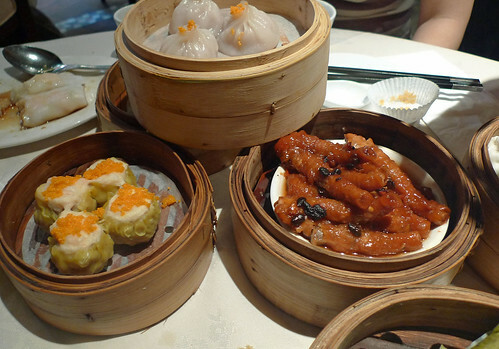 Em, our yum cha connoisseur stated that the yum cha at Imperial China was far superior to our favorite haunt, Peninsula at North Greenwich and the best she has had in UK so far which was rather high praise indeed. My favorite dish is the taro with glutinous rice roll which I could gladly inhale an entire dish all on my own. The service was quick and polite without being intrusive. Dishes piled up on our table during our gorging session. Our bill came up to just under £60 for 4 people which is very reasonable for London standard. Most of all, it was a wonderful meal because of the 3 wonderful friends I have the privilege of spending time with. I don't generally go for shao mai (or siew mai in Cantonese) but this version is delightful. They sprinkled fish roe on top. The Xiao Long Bao (direct translation small dragon bun) was beyond scrumptious. Just the right amount of "soup" wrapped up in the dumpling. Glutinous rice wrapped up in taro. My favorite.